The outspoken Mayor of Calgary, Naheed Nenshi , has attracted widespread attention for his quick-witted responses on Twitter. Reddit users found it clever, too, and the story made it to the site's home page. According to Metro, the story had received more than 2,000 "up" votes and 900 comments by Sunday, just one day after the original tweets were written. The popularity of the post spawned a copycat tweet, this time claiming that Nenshi was responsible for bringing the Doritos taco to Calgary, and backed up the claim with a Batman reference. Unfortunately, Nenshi confirmed on Twitter that the taco-related tweets were not actually from him. All that activity on Twitter — both real and fake — has encouraged lots of people to follow the mayor on the social network, and pushed him over the 50,000 follower mark late Tuesday. While Reddit might have only just become aware of how much personality Calgary's mayor brings to his Twitter account, Calgary residents and Canadians nationwide have seen him in action before. Back in August, one Twitter user wrote a crass criticism of how Nenshi was running Calgary, and without missing a beat, Nenshi shot back. Needless to say, when his newly-acquired fan base on Reddit found the exchange, they were delighted. In November, however, Nenshi took things a step too far in the eyes of many Canadians when he retorted to a Twitter user that he or she must be "off your meds." 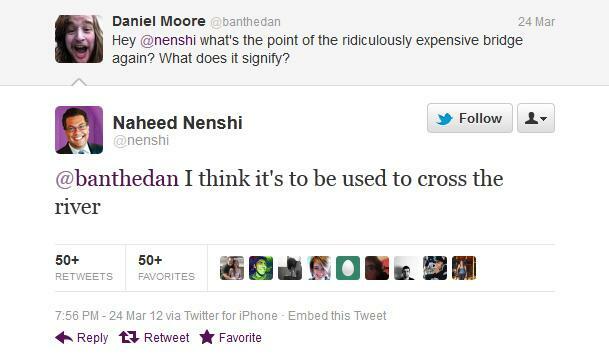 Nenshi later apologized, but it doesn't seem to have slowed his tweeting down. As of writing, there have been 8,330 tweets sent from the @nenshi account. Nenshi has been Calgary's mayor since October 2010.